Obituary for Irene (Magnuson) Scott | Doolittle Funeral Service, Inc.
Irene (Magnuson) Scott, 102, of Portland, wife of the late James C. Scott, passed away on Saturday, February 2, 2019 at Middlesex Health. Born in Portland, she was the daughter of the late Frank and Ruth (Hallquest) Magnuson. 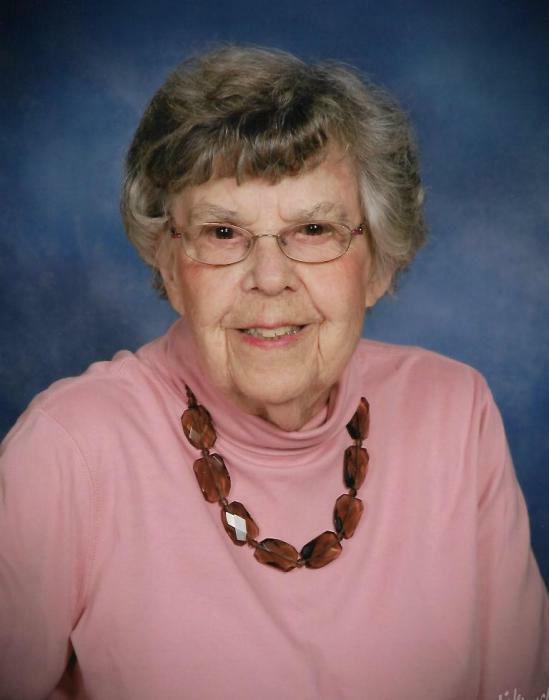 Irene was a lifetime member of Zion Lutheran Church where she served on the Altar Guild and various other committees. Irene was a buyer at Bunce’s in Middletown where she met her future husband. After two of their three children were out of school, Irene began her career working for the City of Middletown at the Russell Library for almost twenty-seven years retiring at age 75. Her position was Acquisitions Assistant and former Head of the Circulation Department. She also worked at the polls during elections for many years and volunteered with the American Red Cross in the 1950’s and 1960’s helping families of servicemen connect with loved ones stationed at foreign and domestic locations during times of family need. After retirement, Irene enjoyed traveling both domestically and internationally with her sisters, other family members and good friend, Lorraine Taylor. She also was an avid gardener and a founding member of the Portland River Valley Garden Club. Irene is survived by two sons, Douglas C. Scott and his wife Kathy of Portland and William E. Scott and his partner Cynthia Gardner of Battleground, WA; a daughter, Leslie S. Pringle and her husband Patrick of Olympia, WA; four grandchildren, Keith Scott (Kishori), Amy Burns (J. William), Cameron Scott (Haley) and Jessie Templeton (Adam); six great grandchildren, J. William Burns, Ryan Burns, Mason Scott, Tyler Scott, Finn Templeton, and Bridger Templeton and many nieces and nephews. Along with her husband and parents, Irene was predeceased by two sisters and their husbands, Pauline and Edmund Kidney and Helen and Victor Galgowski and her sister-in-law, Anne S. Christopher and her husband Norman. The Scott family would like to say a special thank you to the staff of Middlesex Health Hospice and the Village at South Farms for their kind, warm and compassionate care. Funeral services will be held on Saturday, March 9 at 11:00 am at Zion Lutheran Church in Portland. Burial will follow in the Swedish Cemetery. Family and friends may call on Saturday morning before the service from 10:00 to 11:00 am at the church. In lieu of flowers, donations in Irene’s memory may be made to Zion Lutheran Church, P. O. Box 202, Portland, CT 06480. To share memories or send condolences to the family please visit, www.doolittlefuneralservice.com.